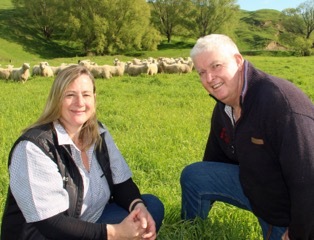 Karen Atkins from Atkins Ranch pictured with Mark Warren of Waipari Station. AUSTIN, TEXAS (Jan. 31, 2017) – Atkins Ranch in Hawke’s Bay, New Zealand, which supplies grass-fed lamb to Whole Foods Market stores across the US and Canada, has been certified to Global Animal Partnership’s (GAP) 5-Step® Animal Welfare Rating program for meat sheep, becoming the first Step 4: Pasture Centered sheep program in the world. Atkins Ranch achieved the Step 4 certification in October 2016, following an audit of their supplier’s ranch, Waipari Station. GAP’s Step 4: Pasture Centered standard means that sheep must live on pasture throughout their life, in addition to meeting more than 100 other standards that cover the entire life and harvesting of the animal. In addition to Waipari Station, 20 other Atkins Ranch ranches have also achieved Step 4: Pasture Centered certification, with 30 to 40 more expected to follow over the next month. GAP-certified products will be labeled to show the Step rating they have achieved.